Keshia Waddell has been a part of the 2016-17 National Early Care and Education Learning Collaborative (ECELC) Family Child Care Home Collaborative in Indianapolis, Indiana. Her program serves 12 children including infants, toddlers and preschoolers. Throughout the ECELC program, Keshia was fully engaged in learning about healthy best practices and showed progress during her technical assistance. At Learning Session 5, the child care providers were asked to present their storyboards. When it was Keshia’s turn, she asked another participant to hold her phone and film her presentation. She explained that she was face-timing with her sister, Natosha, who operates a family child care home in San Diego, California. Keshia expressed that she had been sharing the materials and information with her sister and together they were implementing healthy best practices within their respective family child care homes. Her sister Natosha was so invested in the ECELC program that she wanted to see the providers’ storyboard presentations. 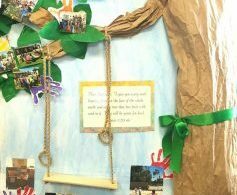 Once Keshia shared this information, the Indiana ECELC project coordinator offered to put together a packet of materials and send them to her sister in California. Keisha added that her sister’s husband is in the Navy, stationed in San Diego, and that Natosha’s child care home serves primarily military families. By sharing this experience with her sister, Keshia has influenced the health of families across the country. Hernandez Family Child Care in California made many new healthy changes regarding nutrition and physical activity. While participating in the ECELC program in 2016, they realized how easy it was to incorporate healthy best practices. The most recent experience was cooking together after reading Green Eggs and Ham by Dr. Seuss. As a family child care provider you are a powerful influence on the children in your care. You create an atmosphere in your home where children can thrive. Modeling healthy habits through your home environment, daily activities, and collaboration with families can make a huge impact on the well-being of the kids you care for.